Bahar Ostadan is interning this winter at the Yunus Centre in Dhaka, Bangladesh. She is majoring in international relations and economics. After a few too many sleep cycles interrupted by the inevitable “Welcome to Dhaka” stomach series, I was finally settled, ready for my first field visit. The Grameen Bank is a Nobel Peace Prize-winning microfinance organization founded by Professor Muhammad Yunus. Grameen pioneers a collateral-free, group-based credit model that uses peer encouragement and a low, declining interest rate to ensure timely loan repayments. 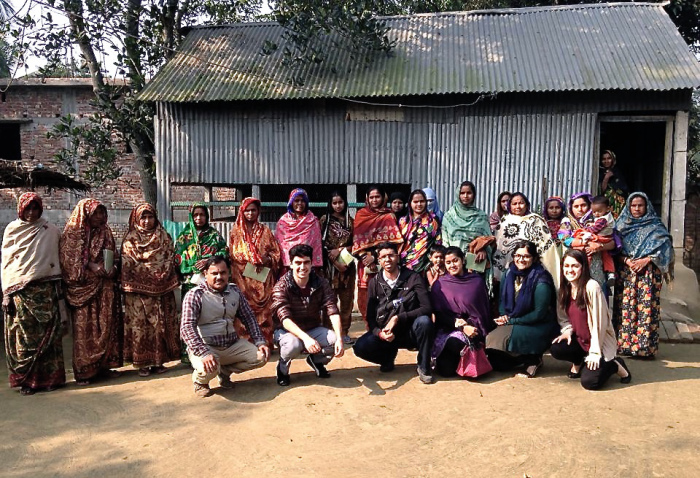 Headquartered in Dhaka, the bank has thousands of branch offices that distribute small loans to impoverished women through local village repayment centers. I visited a branch office about 1 hour outside Dhaka with 3,104 borrowers, 68 village centers, and 6 center managers. This particular branch had 296,000,000 BDT (~ 4,000 USD) in savings and a 100% repayment rate. Just before 8am we joined a center manager on his first collection trip of the day, driving through swarming bazaars until we reached the village center. The 50 loan recipients, women ranging from 20 to 80 years old, built the tin and wood repayment center themselves. This process gives them communal ownership over the space, and, in turn, their financial affairs. As with any village, the women knew everything about each other’s personal lives and finances – from those who had taken the same 6,000 BDT (~ 80 USD) loan for 20 years to those who sent their sons to university in Dhaka with 200,000 BDT (~ 2,600 USD) loans. While collecting cash bills one by one, the collection manager made conversation with the borrowers. One woman started crying. She explained that she doesn’t come to Grameen for the loans anymore, as she doesn’t need them, but rather to see the other women. This woman’s immense personal connection to Grameen’s model challenged my understanding of what it means to have social impact. Previously I had been fascinated by metrics of poverty and improved living standards like the Gini index, but it wasn’t until that moment that I became curious about the group model’s psychological and emotional effects. After the meeting, the same woman graciously invited me to her home. I walked slowly behind her, holding my shawl loosely across my chest, watching my feet tiptoe between fragile mustard flowers. We passed a group of small children playing, ducking to dodge the bicycle tire one boy chucked at another. The woman turned to me and pointed at a small tin structure. She described how after her husband died in the 1971 (during Bangladesh’s Liberation War), Grameen was the only reason she was able to build shelter. Directly next to the tin structure were two larger wood buildings. The woman proudly explained how she was able to build a house for herself and her children’s families, buy two Australian cows, and maintain a water pump. Grameen’s impact was visually obvious: her small tin shack was overshadowed by two homes, a terrace of livestock, and a 10-member well-fed family. Upon returning to the branch office I asked the center managers how they observe and document this type of social impact. The manager showed me an education survey that is regularly distributed to loan recipients, recording the number of students in every village studying in each school level. He explained how Grameen supplements the survey with awareness campaigns about family planning and smarter sanitation choices. However, it seems like the missing link is social impact documentation as thorough as Grameen’s financial records. As it is a bank, this is not Grameen’s first priority. So I wonder: How can we incentivize better documentation of improved living standards in order to gauge the extent of Grameen’s social impact? Is there a way to leverage local university students’ research skills on behalf of Grameen? Looking forward, it is clear that many children of Grameen borrowers enroll in university either in Bangladesh or abroad. So what is the future of the current generation of Grameen borrowers? Will there be an increasing need for microfinance in urban areas?